A step into the future should also be a transformational move. One, which not only educates you, but also prepares you for life, for social responsibility and all the noble ideals the Constitution of India upholds. Here at M G Law College, learning makes you socially relevant, technically competent and professionally sound. The courses are comprehensive and multidimensional. The environment an ideal balance of work and play. The teacher-taught connect mutually inspiring. 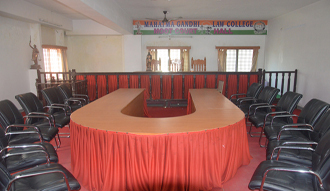 Experience M G Law College. This College is established in the year 1991 as a dream project of the Bhagya Nagar Educational Society. The vision and mission of this Law College is, the forward - looking of spreading Legal Education in right perspective. This college is Permitted by the Bar Council of India, New Delhi, Affiliated to the Osmania University, Hyderabad, Andhra Pradesh and Permanently approved by the Government of Andhra Pradesh. This college is located in its own spacious building with good infrastructure which was inaugurated by His Excellency, Shri Sushil Kumar Shinde, the then Governor of Andhra Pradesh. 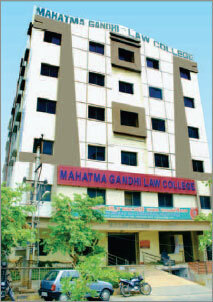 The Mahatma Gandhi Law College, Hyderabad, is Ranked 8th among Law Colleges in India (India Today - ORG MARG Survey, 2004). This Law College offers LL.B., 3 YEARS & 5 YEARS Course. This college is also offering the LL.M., Course through the distance as well s regular mode. Candidates from all over India seek admissions here, year after year. The students of this college are getting the ranks in the LL.B., Examinations conducted by the Osmania University, Hyderabad. 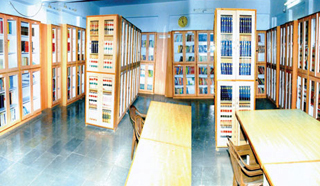 Mahatma Gandhi Law College, Hyderabad, was established in the year 1990 by the Bhagyanagar Educational Academy to offer Legal education with good academic standards supported by the efficient and dedicated faculty members. The Bar Council of India, New Delhi and Osmania University,Hyderabad were kind enough to accord affiliation to this college.The State Government was pleased to accord permanent affiliation to the college to run LL.B. and LL.M. courses. It is a moment of pride to us and our alumni that in the survey conducted by the popular Enlights magazine “The Week” (June20th 2010), the College was placed in the First Place in Andhra Pradesh as the most preferred Law College.Added to this, the survey conducted by “India Today”, the Popular National Magazine placed this Law College in 8th position among top 10 Law Colleges in India (2004). The students from different parts of the country are taking admission in this college besides the native students. This college is functioning in its own building inaugurated by His Excellency Sri. Sushil Kumar Shinde, the then Governor of Andhra Pradesh. The college is so located that the students have access to watch the Court Proceedings and obtain professional experience,as the District Courts are contiguous to the college.This building of 8 floors has spacious class rooms with sufficient furniture and good library. All the classrooms are named after legal luminaries. The College has an administrative wing headed by an Administrative Officer. The college also has a well furnished Moot Court Hall, inaugurated by Hon'ble justice Sri. C.V. Ramulu. In April 2015, the college got the distinction of being the first Law College in the state of Telangana to conduct the first Telangana State Level Moot Court Competition. In April 2014 the College conducted the twin cities Moot Court competation. In February 2009, the college conducted the Andhra Pradesh State level Moot Court competition. In March 2008 the college conducted the twin cities Moot Court competition.It is our privilege to mention that Hon'ble Justice Sri J.Chelameswar, Judge, Supreme Court of India, and Hon'ble Justice Sri G. S. Singhvi, Judge, Supreme Court of India, were pleased to visit this college.Hon'ble Justice Sri L. Narasimha Reddy, Chief Justice of the High Court at Patna (Bihar) was also pleased to bless the students of this College. Hon'ble Justice P. Shiva Sankar, Hon'ble Justice Mohd. Sardar Ali Khan, Hon'ble Justice T. Ranga Rao, Hon'ble Justice P. Ramarkishna Raju, Hon'ble Justice N.Y. Hanumanthappa, Hon'ble Justice B.S.A.Sway, Hon'ble Justice R.M Bapat, Hon'ble Justice A. Gopal Reddy,Hon'ble Justice K.C. Bhanu, Hon'ble Justice V.V.S. Rao, Hon'ble Justice P.Swaroop Reddy, Hon'ble Justice G.Chandraiah, Hon'ble Justice N.Ravisankar, Hon'ble Justice B.Sesha Sayana Reddy,Hon'ble Justice C.V. Ramulu, Hon'ble Justice B.Chandra Kumar,Hon'ble Justice M.Seetha Rama Murthy, Hon'ble Justice A.Rajasekhar Reddy, Hon’ble Justice C. Praveen Kumar, Hon’ble Justice A.V. Sesha Sai and Hon’ble Justice Dr. B. Siva Sankar Rao,the Hon'ble Judges of the High Court of Andhra Pradesh and Sri. M.Vijaya Kumar, Hon'ble Member (Judicial), State Administrative Tribunal were pleased to visit this College on several occasions to bless our students. It is a matter of joy to mention that the former Chairmen of the Bar Council of India, New Delhi, Sri S.K. Khaarventhan, Sri. Gopakumar Nair, Sri S.N.P. Sinha, visited the College, Shri Boje Gowda, Vice-Chairman, the Bar Council of India, New Delhi, Sri Dhanpal Raj,Former Vice-Chairman, Bar Council of India, New Delhi, Shri Vijay Bhatt, Member, Bar Council of India, New Delhi, N.RamchanderRao, Member, Bar Council of India, New Delhi, Sri. M. Rajender Reddy, former Member, Bar Council of India, New Delhi and Sri A.Narasimha Reddy, the Chiarman, A.P. State Bar Council, Visited this college and addressed our students.Prof. V. Balakista Reddy, the Registrar, NALSAR, Hyderabad and Prof. K.V.S. Sarma, the former Registrar, NALSAR, Hyderabad were also the distinguished guests to this College on different occasions.The students of this college participated in All India Moot Court Competitions several times. With the support of students, faculty,advocates, judicial officers, the college is conducting several legalaid and literacy camps. The pinnacle of our achievements is winning of seven gold medals by our students from the Osmania University, Hyderabad between2010-2012.It is a matter of pride that many alumni of this college such as Smt.Sharadha Devi, Miss. Maitreye, Smt. Kavitha, C. Balachander, Smt.K.Harsha, Smt. D.Varudhini, Jacob Mudi, Smt. Achuta Valli and K.Yuvraj were selected as Junior Civil Judges. Another student Mrs.Balalatha was selected for All India Service in Union Public Service examination.The students of this College are getting good positions in the Multi-National Corporations like Quisilex, Bajaj-Allianz, Mahindra Finance and Coca-cola in addition to being absorbed by the Senior Advocates in and outside the State. The District Legal Service Authority of Ranga Reddy District established a Permanent Legal aid Clinic in this college in the year 2006. This Legal aid Clinic is catering to the legal needs of the poor and illiterate people and the Ranga Reddy Districts Legal Service Authority is extending its support.This College is dedicated to the cause of the study of law. Why should we learn the laws in our country? To know about our rights and dignity - To experience the values of human rights - To participate effectively in the democratic governance - To understand our duties towards others and our country - To affirm and assert our rights - To transform unjust and oppressive statutes - To work for the betterment of people around - To fight against oppression, corruption, exploitation and injustice - To empower the poor and the downtrodden - To uphold the truth, and preserve unity and integrity of the nation. “Justice is the basis of any society that wants peace and progress. Law is the instrument for delivery of justice. And yet the tragic truth is that law is often not on talking terms with justice and is even hostile to it. This shall not be. A new awareness, a creative consciousness, a purposive art which will expose this unjust and unjustified antagonism and promote a cross-fertilization of law and justice is the demand the people make out on the jusrists-statesman'' Justice V R Krishna Iyer, Supreme Court of India.